Dechlan completed the German in Germany Study Tour in Summer School, 2017, before starting his exchange at the Technical University of Munich for a Full Calendar Year in 2017. The following blog post is an excerpt from Dechlan’s blog, Dechlan and Deutschland. 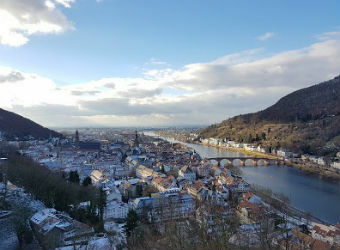 I arrived in Germany on the 4th of January and spent the first couple of days adjusting to the colder climate and doing a bit of sight-seeing with a good friend. The snow was obviously the major attraction. Although I have seen snow in Australia on the ski slopes, it is a completely new experience to see it lining the streets of a city and decorating the roofs of houses. Every photo was made better and this was more evident than ever in Heidelberg, where it just made the castle and its surrounding gardens that tiny bit better. After I had become accustomed to the winter wonderland that surrounded me, I was naturally blown away by the stunning architecture of just about any Altstadt (old town). Just looking at a stunning old building began the inception of so many questions about who had lived there. How long for? How did they live? This was to the utter frustration of my friend, who obviously couldn’t answer them, but I always ensured that these questions were vocalised in order to express my interest. After my first 4 days in Germany, I travelled to Stuttgart to begin my first language course. Typical of me, I had high expectations for what needed to be accomplished in the course. As a result, this would cause both a lot of stress in the days to come, but also a slight shift in the way I perceive the future of my exchange. I expected to submerge myself in the German language and immediately leave English behind, but it was never going to be that straight forward. In the first week I got to know many new people. I began German classes, and it didn’t take long for me to discover that it was going to be easier said than done just to ‘leave English behind’. I felt like I had learnt so much in a year of German, however it also became clear that there was still a very long way to go. It was difficult to express every idea that I wanted with a very limited vocab and many grammar rules missing. Also, the largest proportion of people participating in the course were beginners, and of the 67 students present – 61 were from Australia. As a result, it wasn’t long before English prevailed as the dominant day-to-day language, and the idea of speaking German was indefinitely forgotten. This was a cause for stress, as it clearly wasn’t what I had planned, and was thus undermining the expectations I had of what I would achieve from the course. Nonetheless, I was still learning many new words by studying German 3 hours a day, 5 days a week. I decided to remove all expectations of what was to come and immediately I felt better. I think this was for the better as I concluded that I will never be able to truly predict what a course or my study will be like. The first week culminated in an excursion to the Black Forest, where we tried traditional black forest cake; had fun with sleds; got to see allegedly ‘average’ German ski fields, which turned out to have more snow than possibly all the mountains in Australia combined; and had epic snow ball fights. The Black Forest was absolutely beautiful, especially with all the snow (no surprises there). The second week began by diving straight into the course work. Every day my German vocabulary was expanding and I was making flashcards endlessly night after night after night. I also had a lot of time on my hands as my afternoon course didn’t run in the second week at all. 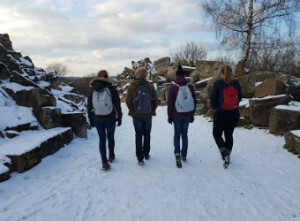 In this time I visited galleries, museums, and hiked around the beautiful snow covered hills of Stuttgart. I also spent a lot of time on the Königstraße, which is the main shopping street in Stuttgart. In Australia, I never considered myself a fashionable person and was never very good at shopping. However, being in Europe and surrounded by many sophisticated looking people, I felt pressured to change this. As a result there were many expeditions to the shops in which, to the annoyance of friends, I spent hours browsing items of clothing often in order to buy just one item. In the end I felt like I had done pretty well but it had definitely thrown my budgeting a bit out of order. The second week ended in a trip to Munich with a small group of friends, which served as a good bonding experience. The trip was full of fun and laughter. We visited many tourist attractions, such as the famous Neuschwanstein castle (what the Disney castle is based off of) and the Nymphenburg palace. It was such a good weekend and I couldn’t have spent it with better people. Week three began, and I began to notice that I was feeling very emotionless. What I mean by this is that I was feeling just as if I hadn’t left Australia. I didn’t feel excited because I was in Germany, or sad because I was missing my family – it just felt like nothing had changed. This was neither good nor bad but surprising, as I had managed to slip into a comfortable cycle of going to Uni and then going home just as I had in Adelaide. To this day it has never really ‘hit me’ that I am now in Germany. It’s almost as if I had thought about it and planned it so much that my body was expecting it. In the 4th and 5th week, things began to change with my German. It started with a bizarre night out where a group of us went around introducing ourselves to some of the locals in a bar and ended up going clubbing with them. I met someone that night who I’d go on to catch up and have my first proper German conversation with. This is when things started to look up for my speaking ability. All of a sudden, after a couple of hours of speaking German, I could now hold a conversation only in German (provided the topic was basic). This made me excited and gave me a feeling of success that increased my enthusiasm to learn more German. In combination with my ever growing vocabulary, I was able to contribute more in class and participate more at the dinner table. The original stress was finally being put to rest by more visible results. At the moment, all I want to do is try and have German conversations, because every time I nail a sentence it is such a satisfying feeling and it boosts my confidence that little bit more. In the final week, I sat my exams, in which I did not do too badly, and then went on to celebrate. There is no doubt that the friends I have made have shaped my experience here in Stuttgart. There have been so many jokes, dumb moments, chats, and so on that have provided laughs and smiles for days on end. I have met so many unique people here, and have had a blast spending the last 6 weeks with them. Without these people, my 6 weeks in Stuttgart would not have been the same. This entry was posted in Europe, Exchange, Faculty of Arts, Faculty of Engineering, Computer & Mathematical Sciences, Germany, Short Programs and tagged advice, Computer & Mathematical Sciences, Exchange, Faculty of Arts, Faculty of Engineering, German, Germany, history, language, recommendations, Short Programs, stuttgart, tips, travel, weekend trips. Bookmark the permalink.